Utilising sensors & automation to simplify bioprocess operations means that more work can be done in less time. By automating the routine tasks carried out in the lab, valuable time can be devoted to more important tasks. Here are two practical examples of automating routine tasks in upstream and downstream bioprocessing with relatively simple instrumentation. Scheduled automated sampling from a bioreactor. This can be from a conventional glass benchtop vessel, rocker, SUB, or SIP stainless steel fermenter. The sterile sample is delivered directly to a fraction collector for analysis at a later time, or directly to an analyser such as a nutrient monitor, cell counter or biochemistry analyser. There is also the possibility to use the analyser results to automatically adjust the feed rate of a pump for nutrient control. These types of systems are set to run 24/7 meaning samples can be taken outside normal working hours. 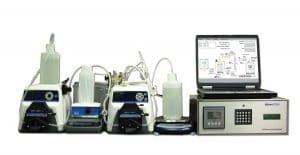 The Flownamics Seg-Flow® Automated On-line Sampling System provides multiple bioprocess monitoring and control solutions for improving process performance. The Seg-Flow system’s patented Segmented On-line Sampling™ technology allows rapid and accurate sampling for up to 8 vessels or process streams and sample delivery to 4 analyzers and/or fraction collectors. Several feed control options are available with the Seg-Flow system, which can control 2 pumps per vessel. Existing off-line and at-line analytics are seamlessly integrated into a multi-functional on-line PAT tool through the Seg-Flow system’s communication interface and FlowWeb™ control software. The FlowWeb software simultaneously acquires all integrated instrument data and can export the data to any OPC-enabled SCADA for enhanced process monitoring and control. Using feedback control from inline sensors means that a TFF (tangential flow filtration) purification system can be set and left to run to an end point, unattended. This could be a conductivity set point or pH or even UV. These sensors are small and low cost, so they can be used in single use systems and multi use systems, from bench scale through to production. The PendoTECH TFF Process Control System™ is an optimal solution that adds automation and data collection to a Cross Flow / Tangential Flow Filtration Process. It includes a powerful yet easy to use Graphical User Interface and recipe based control of entire concentration and diafiltration process. Multiple options are available for automated diafiltration end point (filtrate weight, conductivity, pH, air in feed line with non-invasive detector, total flow). Pressure measurement and calculation of trans-membrane pressure (TMP) and delta-P with PendoTECH Pressure Sensors™. Industry standard scales & pumps (peristaltic, rotary lobe, diaphragm, etc) can be interfaced with the system along with other optional accessories to create an advanced yet flexible system. It is ideal for process development and pilot plant where the project requirements can change. Incorporating sensors & automation into your process, also provides repeatability and consistency in results. Data is collected digitally and can be distributed to corporate archiving and integration into SCADA systems. Processes can be run to pre-defined menus, ensuring each step is recorded. Reliable and simple operation provides a level of control so that the operator can “walk away” from the process with confidence. 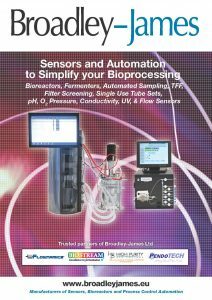 Broadley-James Ltd distributes a wide range of sensors & automation equipment specifically designed for bioprocessing. We have selected partners who are Industry Leaders in their field, more information is available on our website here.